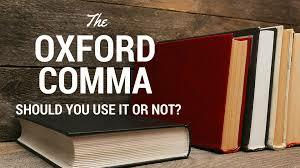 The Oxford comma, or serial comma, is the comma placed inside a list of items and can cause the individual who reads the list to be confused. For example, the list of "cars, trucks, and wagons" indicates three separate types of ways of transportation. However, if you leave out the comma and write it "cars, trucks and wagons" some individuals including the United States Court of Appeals for the First Circuit, would say the phrase coming before the three words in the list might take on a different meaning because of the lack of the second comma. Does the law intend to exempt the distribution of the three categories that follow, or does it mean to exempt packing for the shipping or distribution of them?" Long story short, the court ruled in favor of the drivers and a settlement was reached with an award of $50,000 each to the five drivers who brought the lawsuit. In addition, "Other drivers will have to file claims to get a share of the funds and will be paid a minimum of $100 or the amount of overtime pay they were owed, based on their work records from May 2008 until August 2012," the Press-Herald reports. Approximately 127 drivers are included in the settlement. Pay attention to your grammar, because there are differences. As a parting example, I will use my favorite example of the Oxford comma. Let's eat grandma. Let's eat, grandma. The first example indicates literally eating your grandma while the second example informs grandma you are ready to eat. Don't be caught between eating dinner and eating your grandma for dinner.